Thank you to everyone who participated in the library’s 3D cookie cutter challenge! In 2nd place, the winner of a $5 Barnes & Noble gift card is the penguin with a Santa hat by Zachary Stallings. In 1st place, the winner of a $15 Barnes & Noble gift card, is Rudolph by Alyssa Sybert. Congrats to our 2 winners! If any participant has not picked up their cookie cutter, please pick it up from the library today. The Lafayette Theatre department is announcing the Spring musical on Wednesday, Jan 4th after school. For every student that shows up, you can enter a raffle to win 2 free tickets for the Spring musical in April. Don’t miss unveiling of the banner! Lafayette students were invited to created cookie cutters in the media center using Tinkercad and the 3D printer. Over 57 students participated in this project creating cookie cutter designs ranging from holiday characters and dinosaurs to monograms and Pokemon! Students and staff voted during lunch on Tuesday and picked their top three favorites. The winners were Alyssa Sybert with Rudolf, Zachary Stallings with Santa Penguin, and Meagan Williams with Dino Santa! 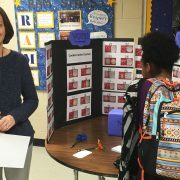 Pictured is Librarian Amy Wallisch collecting votes. Thanks to all for participating in this creative and fun endeavor. 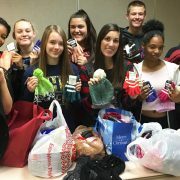 In the spirit of the holidays, Mrs. Snelling’s English classes donated hats and gloves for local elementary students in need as part of their community service projects unit. Teachers Mrs. Snelling and Mr. Jefferson will be delivering the winter clothing to students at Norge Elementary and James River Elementary this week! Voting for the best 3D printed cookie cutter will take place during all 3 lunches today! The winner will receive a Barnes & Noble gift card. Stop by, and check them out! Current and former German students: Please join us for our annual holiday party today from 2:30- 3:30 pm in room 628. Come and enjoy German Christmas cookies, hot cocoa and cookie decorating. We look forward to seeing you! Current and former German students: Please join us for our annual holiday party tomorrow from 2:30- 3:30 pm in room 628. Come and enjoy German Christmas cookies, hot cocoa and cookie decorating. Please RSVP today with Mrs. Woodrum through the “remind” app or stop by room 628. We look forward to seeing you. Join in on the holiday fun this week with our Holiday Spirit Days! Tomorrow is Ugly Sweater Day, and Wednesday is Holiday Character Day. Each year over 2,600 teens die in automobile collisions, 81% of those were passengers. Whether you are driving or riding, remember to always wear your safety belts. The LHS Book Club will meet today during AEP. Please bring your copy of the book with you. Holiday Candy Grams will be sold this week during 1st & 2nd lunch and after school in Mr. Downs room 112. The cost is $1.00 or a deluxe for $2.00. The y will be delivered on Tuesday and Wednesday of next week. Current and former German students: Please join us for our annual holiday party on Tuesday, Dec. 20th from 2:30- 3:30 pm in room 628. Come and enjoy German Christmas cookies, hot cocoa and cookie decorating. We look forward to seeing you. Join in on the holiday fun next week with our Holiday Spirit Days. Monday is Family Holiday Card Outfit Day, Tuesday is Ugly Sweater Day and Wednesday is Holiday Character Day. 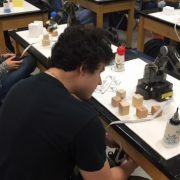 Mr. Aadahl’s Engineering Explorations students taught robotic arms how to move through an obstacle course and complete complex tasks. This valuable training may lead to a careers in manufacturing or CNC machine operation. Holiday Candy Grams will be sold today during 1st & 2nd lunch and after school in Mr. Downs room 112. The cost is $1.00 or a deluxe for $2.00. They will be delivered on Tuesday and Wednesday of next week. The LHS Book Club will meet tomorrow during AEP. Please bring your copy of the book with you. Each year over 2,600 teens die in automobile collisions, 81% of teens killed in automobile collisions were passengers. Whether you are driving or riding, remember to always wear your safety belts. Lets help welcome our new military students into the Ram Fam. Please join Student 2 Student tomorrow during AEP in the Media Center. Please see Mr. Jefferson to pick up a pass. 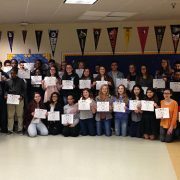 Sophomores and Juniors: This is a reminder that the deadline for applications to Summer Governor’s School programs are due to Mrs. Shaver in the counseling office by Friday, Dec 16th. Current and former German students: Please join us for our annual holiday party on Tuesday, Dec. 20th from 2:30- 3:30 pm in room 628. Come and enjoy German Christmas cookies, hot cocoa and cookie decorating. We look forward to seeing you!